When we have hundreds of files that refer files to a same theme, the most usual thing is that we will want them to have a similar name, or to have them in folders with correlative names. But if we are speaking about a really big quantity of files, with the file explorer we will be going round the bend way before we finish. 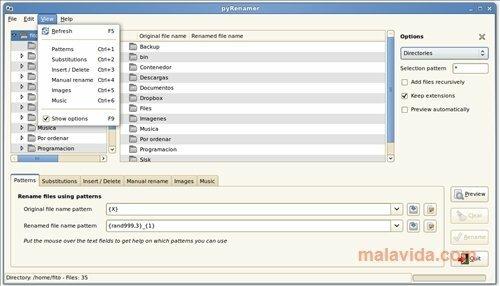 That is why pyRenamer is a great option to perform these tasks. - Rename as many files as we want. - We can save the patterns that we normally use to rename. - It is possible to redo/undo. - Change the name of music files. - It makes sure not to eliminate any extension when it is renamed. - Possibility to change some icons to better distinguish between files. All this with a quite simple interface where we will always have all the files, folders and options visible.